A light bulb is nothing without the right lighting fixture to power it. At least, that is the thinking behind Internet retailer 1000Bulbs.com expanding into home lighting fixtures. The broad, new product line, which includes everything from chandeliers to outdoor lanterns, may be the company's largest product expansion since its inception in the early '90s. 1000Bulbs.com already carried a large selection of commercial and warehouse lights including wall packs, flood lights, and high bays. However, the number of home lighting fixtures added easily eclipses the commercial offerings. With 3,000 new products spanning 16 categories, customers are hard-pressed not to find at least one fixture to suit their home lighting needs. 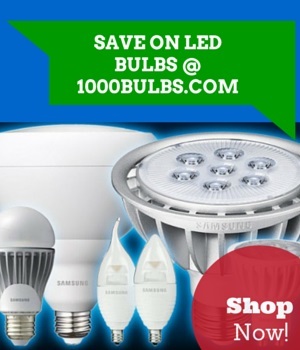 Despite the large number of new products, 1000Bulbs.com has focused on bringing in only high-quality lighting brands. These brands include Nuvo, Troy Lighting, Lazy Susan, Hudson Valley, and the artisan brands Arteriors Home and BoBo Intriguing Objects. Though consumers often consider these to be high-end brands and may assume their prices will be high, 1000Bulbs.com promises competitive pricing, encouraging clients to call into the company's 800 number for special rates and package deals for large lighting projects, such as hotels, restaurants, and retail. Most of the new lighting fixtures are part of wider product families. A chandelier, for example, often has a ceiling light, wall sconce, pendant, and vanity to match. Multiple color and style variations are also available to satisfy antique, traditional, transitional, and modern design schemes. Antique lighting fixtures have been especially popular, with Troy, Hudson Valley, and Lazy Susan lamps, sconces, and pendants attracting broad customer interest. Despite the large number of new lighting fixtures on the website, 1000Bulbs.com insists it is first and foremost the Internet's source for light bulbs. This is evident in the "accessory" tabs on product pages where the 1000Bulbs.com staff has recommended the appropriate standard, energy saving, decorative, or antique light bulb to pair with the fixture. Customers are encouraged, for example, to pair reproduction tungsten filament lamps with antique style pendants and incandescent globe lights with bathroom vanities. 1000Bulbs.com plans even further expansion into home lighting throughout 2012. The company is considering additional well-known brands, a wider pricing selection, and more Energy Star Qualified fixtures for future product rollouts. About 1000Bulbs.com: 1000Bulbs.com is an award-winning Internet-based lighting retailer. The company offers everything from simple, household light bulbs to cutting-edge specialty lighting systems. Nationally recognized for growth, innovation, and customer satisfaction, 1000Bulbs.com is an influential force in the lighting industry. Jun 29 Does Blue Light Affect Sleep? Jun 22 1000Bulbs.com Now Has Lighting Fixtures!